The second national suffrage organization established in 1869 was the American Woman Suffrage Association (AWSA). Margaret Foley distributing the Woman's Journal, library of congress. The second national suffrage organization established in 1869 was the American Woman Suffrage Association (AWSA). Unlike the rival National Woman Suffrage Association (NWSA), AWSA supported the Fifteenth Amendment that granted African American men the right to vote. Lucy Stone and her husband Henry Brown Blackwell teamed up with other prominent reformers—including lecturer and author of the “Battle Hymn of the Republic” Julia Ward Howe, writer Mary Livermore, and famous preacher Henry Ward Beecher—to create AWSA. The organization was headquartered in Boston, a city known as a center of reform movements. In 1870, Stone established The Woman’s Journal, which quickly became a successful suffrage newspaper. The paper announced and recapped the association’s meetings, discussed suffrage issues, and detailed strategies. The Woman’s Journal lasted beyond the end of the suffrage movement, ending publication in 1931. The AWSA quickly became the more popular organization because it was more moderate in its aims. While the National Woman Suffrage Association (NWSA) advocated for a range of reforms to make women equal members of society, the AWSA focused solely on the vote to attract as many supporters as possible. Unlike the female-led NWSA, the AWSA also included prominent male reformers among its leaders and members. AWSA leaders also pursued a state-by-state strategy, which they thought would be more successful than NWSA’s efforts to pass an amendment to the Constitution. Why did Lucy Stone organize the AWSA rather than join the National Woman Suffrage Association (NWSA)? How did AWSA's goals and strategies differ from that of the NWSA? Photograph of Margaret Foley (right?) 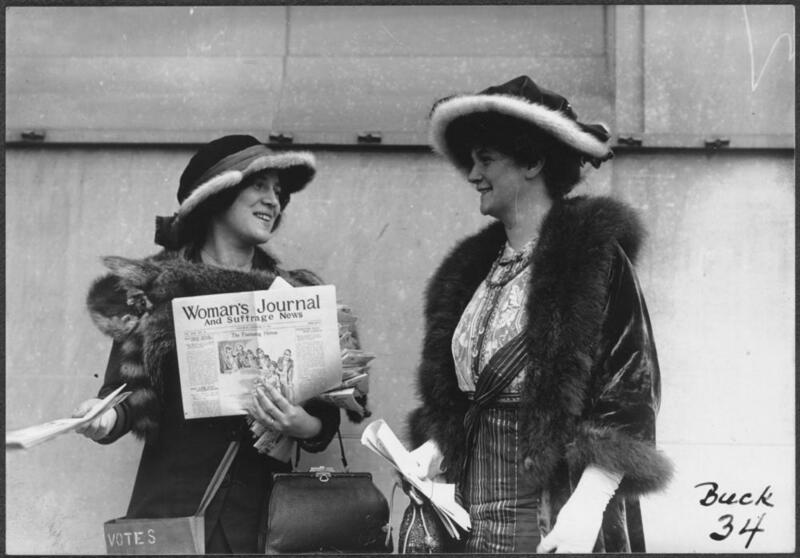 and an unidentified woman (left), both carrying pocketbooks and wearing fur-trimmed hats and fur stoles, standing outside and distributing copies of the November 29, 1913, issue of the Woman's Journal and Suffrage News. The woman on the left has a cloth satchel strapped across her body, labeled VOTES. National American Woman Suffrage Association, “The Woman's journal. (Boston, Mass.) 1917,” Ann Lewis Women's Suffrage Collection, accessed October 5, 2015, https://lewissuffragecollection.omeka.net/items/show/1128. The Woman’s Journal was created by Lucy Stone for the American Woman Suffrage Association (AWSA) in 1870. It was the first newspaper on suffrage that was successful, and it was in circulation throughout the movement. This front page of the Woman's Journal and Suffrage News is from March 8, 1913. Pictured are Rosalie Gardiner Jones, Inez Milholland on a white horse, floats, and an aerial view of the Woman Suffrage Parade of 1913. The parade was organized by Alice Paul and took place in Washington, D.C. the day before President Wilson was inaugurated. 8,000 women marched and an additional half million people watched the parade. American Woman Suffrage Association Poster advertising Abigail Duniway as a featured speaker at a meeting of the American Woman Suffrage Association (AWSA), on a bill with other nationally prominent leaders.